After sweating (or shivering, depending upon your reaction to stress) through an entire SAT exam, you have one last task to perform. Go through your responses, marking them correct or (sigh) incorrect according to the key in this chapter. Then read the explanations for any wrong answers, plus any answers that you guessed correctly. Alvin Toffler, the author of the quotation in the prompt, is known as a futurist, someone who analyzes trends in society in order to determine how things will change in the decades to come. He has often written about technology and the need to adapt, both on the individual and the corporate or governmental levels. You don’t need any of the preceding information to write a good essay, however. You just have to zero in on the key words in this quotation, which are illiterate (a term traditionally used for someone who cannot read or write) and “unlearn.” Toffler’s quotation changes the definition of “illiterate” in a surprising way because “unlearn” isn’t on most people’s list of great activities (particularly teachers’ lists!). Before you write your essay, you have to decide whether or not you agree with Toffler. If you do, your essay may focus on what must be “unlearned.” For example, you can mention something — quill pens, for example — that has been supplanted (replaced) by better technology, such as the computer I used to write this book. Then you can talk about the “relearn” portion of the quotation, in which the former quill-pen user has to learn to write with a word-processing program. Teachers (the people who will score your essay) appreciate thoughtfulness. In the preceding quill pen/computer example, don’t stop at the easy point: the convenience of changing a word or phrase without rewriting the entire paper. Go deeper. How do computers change the way people write and think? Does the ease of revision make better writers? Or does the machine give the writer the impression that no draft ever has to be completed, given that a keystroke or two can change anything? Introduction: Refer to Toffler’s quotation and your support of his ideas. (For example, you may write, “Those who cling to old, outmoded knowledge are losing ground in our changing-every-nanosecond society.”) Mention two or three supporting ideas. Body paragraphs: Elaborate on one example in each body paragraph. The pen/computer example would be one paragraph, the change to social networking might be another, and so forth. Conclusion: Consider the implications of Toffler’s ideas. Here’s one: People inclined to rigid, structured ideas might be left behind and become bitter as the world moves on without them. Introduction: State your objections to Toffler’s quotation. (With this approach, you may say something like “Tradition and a knowledge of history are important in order to place new ideas or skills in perspective.”) Mention two or three supporting points; one might concern the need to know what the law was in order to understand why it has been changed. Body paragraphs: Devote one body paragraph to each example. Be sure to include enough detail to make the case that “unlearning” is a dangerous practice. You can organize your essay in other ways, too, and still end up with a fine score. Measure your work using the rubric (scoring guide) in Chapter 7. 1. C. The only two answers in the running here are Choices (A) and (C) because the assumption is that giving to those who are less fortunate is a positive quality. Therefore, you’re looking for a positive word. Because (C) is more specific than (A), (C) wins. People who havecompassion express sympathy and concern for others. 2. B. This one is easier than it first appears, given that you know the meaning of decipher, which is what you do when you stare at a code — or bad handwriting — until you figure out what the letters are. None of the other second choices make sense. You don’t evaluate (assign worth to), alleviate (ease), or normalize (make normal) handwriting. You may scrutinize (study carefully) it, but because the first part of the sentence already has the clerk squinting at his supervisor’s scribble, you don’t need to say it again. There you go: Choice (B), which states that the handwriting is illegible (unreadable) and something to decipher, is your answer. 3. A. The key word in this sentence is though, which tells you that you’re switching from a positive to a negative or vice versa. Look for opposites and Choice (A) pops up. The method was antiquated (outdated) but it got the job done, being effective. 4. A. If you were filling in the blank with your own word, you’d probably choose “muscled” or “strong.” Okay, all you need is a synonym for “strong” — which is Choice (A), brawny. Choices (B) and (C) are opposites because both imply a lack of muscle, with emaciated adding a touch of illness. Choices (D) ardent (passionate) and (E) salubrious (promoting health) aren’t even close. 5. B. You probably guessed that the word for this blank must be a synonym of “say.” Only Choices (B) and (C) fall into that category, but promulgate has a public element to it, implying a cable news report or passionate speeches to crowds. The more neutral articulate (explain clearly) is a better fit here because the implied audience for the students’ speech is one person, the principal. 6. D. Both Abigails had a tough time, but you know more about Abigail Adams (the subject of Passage II) because the author explains that she faced the “depreciation of Continental paper money, the difficulties in the way of managing the property of her husband, [and] her own isolation” (Lines 15–17). All you know about Alcott is that her life included “hardship, poverty, [and] the grief of seeing her husband misunderstood” (Lines 1–2). Because Passage II includes more detail, Choice (D) is the best answer. 7. C. To answer this question, untangle the long sentence quoted from Alcott’s letter. She mentions the “affectionate sympathy and aid of my husband” (Lines 9–10) and the “increasing health and loveliness of my . . . little Anna” (Lines 11–12). Although the passage doesn’t explicitly state that Anna is Alcott’s daughter, the my implies a parental relationship. No doubt about it: Choice (C) is the answer you seek. 8. E. The passage states that Adams’s letters are “remarkable” (Line 20) because they reveal how she “could devote herself to the most opposite duties” (Lines 21–22), including those mentioned in the question. This fact may have tempted you to choose (A). However, the passage doesn’t tell you that she held public office. Instead, she was “speculating upon the probabilities of peace or war” (Lines 28–29). The clincher is that as a mother she was “writing the most exalted sentiments to her son” (Lines 30–31). The reference to writing makes (E) the best choice. 9. D. The roles listed in the lines following “opposite” include farmer, merchant, politician, and mother. A varied selection, don’t you think? You’ve got it: Choice (D) works here. 10. D. Several definitions of innumeracy are possible, and many of the concepts named in the answer choices appear in the passage. However, the passage as a whole addresses more than counting, sets, functions, higher-level math, or the complexity of math. Instead the passage attempts to explain why people can’t understand mathematical concepts — Choice (D). 11. B. A key idea in this passage is that in math, “all unnecessary details have been stripped away by the process of abstraction” (Lines 29–31). These lines point you to Choice (B), which states that math is abstract (theoretical). 12. C. Lines 34–35 state that “you want A , B, and C to have human dimensions,” but they don’t. Or, as Lines 35–37 put it, “they simply stand for numbers, sets, or some other apparently barren concept.” Choice (C) is the answer. 13. D. The passage states that people are “used to thinking complex thoughts about complex subjects, namely other people” (Lines 20–22) and that “we cannot get used to thinking about such simple subjects” (Lines 24–25) as math. In this question, Choice (D) stands for “definitely the answer”! 14. C. People ascribe (attribute, assign) human characteristics to abstract mathematical concepts “to make the characters real” (Line 46) because their minds are “used to more complex situations” (Lines 47–48). So when you’re solving a math problem, you’re trying to make it more familiar, more comfortable. If you don’t, the problem is “alien” (Line 48) — unfamiliar — also known as Choice (C). 15. E. The passage firmly states that “the best way” (Line 58) to teach math is “to move gradually toward simple, abstract situations from complicated, real-life ones” (Lines 60–61). Yup, Choice (E) is the answer you want! 16. C. The passage as a whole urges the reader to “work . . . downward through the mud and slush of opinion, and prejudice, and tradition . . . through poetry and philosophy and religion” (Lines 19–25). Instead of these human traits and accomplishments, the author urges the reader to “spend one day as deliberately as Nature” (Lines 1–2). In other words, the narrator sees Nature idealistically — Choice (C). 17. E. In the passage, “deliberately” (Line 1) is followed by the wish “not to be thrown off the track” (Line 2). In other words, the author calls upon the reader to avoid distraction. That request takes you to either Choice (A) or Choice (E), two answers that indicate focus. However,single-mindedly introduces an element of obsession or fanaticism, and “deliberately” works better with the less emotional “purposely,” which is Choice (E). 18. A. Thoreau lists all the things that should happen “without perturbation” (Line 5). Perturbation (worry or trouble), includes “company” (Line 6), bells’ ringing, and children’s crying. In other words, small stuff! A nutshell and a mosquito’s wing are also small, so Choice (A) is the best answer, because trivialities are unimportant things. 19. B. When “the engine whistles” (Line 15) and “the bell rings” (Line 16), the author asks, “Why should we run?” (Lines 16–17). His alternative is to “settle . . . and work” (Lines 18–19). Therefore, you can easily rule out Choices (A) and (E). The passage contains no hint of danger or helpfulness, making (C) and (D) nonstarters too. You’re left with Choice (B), which fits with the wish, expressed throughout this passage, to live in accordance with Nature. 20. D. Although the author says that he has “been regretting that I was not as wise as the day I was born” (Lines 50–51), he isn’t discussing education but rather the way in which human beings tend to move away from a natural rhythm and wisdom toward a more artificial way of life. Choice (D) wins the prize. 21. B. The “Realometer” is a play on words. Just as a “Nilometer” (Line 31) measures the water level of the Nile, a “Realometer” measures a “freshet of shams and appearances” (Lines 32–33). The footnote tells you that a “freshet” is “a flow of water,” though in this passage the word is used metaphorically to indicate a flow of pretense — Choice (B). 22. C. The second paragraph begins with a metaphor (an imaginative comparison) — time is “but the stream I go a-fishing in” (Line 43). The passage also says, “While I drink” (Line 44) — during the author’s lifetime — the bottom, or death, is visible through the shallow waters. Yet the author states that “eternity remains” (Line 46). You can see that I and II are true, but what about III? Nothing in the passage discusses goals, so III doesn’t make the cut. Yup, Choice (C) is the best answer. 23. D. The sentence after the comment cited in the question says, “I feel all my best faculties [abilities] concentrated in it” (Lines 54–55), with “it” referring to his head. Thoreau goes on to compare his head to the “snout and fore paws” (Line 57) of an animal that uses these body parts to burrow. Therefore, the author’s “head” is his means of work, steering you to Choice (D). 24. C. When dinner is a “terrible rapid and whirlpool” (Lines 9–10) and reality is a “hard bottom and rocks in place” (Line 26) and his intellect is a “cleaver” (Line 51), you know that you’ve left reality and entered the land of imagination, which is where metaphors and similes — ­literary devices that compare one thing to another — reside. Yup, Choice (C) is the best answer. 1. B. Use the acronym PEMDAS (see Chapter 12 if you don’t remember what it means) to know that you need to deal with the parentheses first, and then the exponent. So, 3(4 – 2)2 – 2 = 3(2)2 – 2 = 3 × 4 – 2. Again, using PEMDAS, you need to do the multiplication before the ­subtraction: 3 × 4 – 2 = 12 – 2 = 10. 2. D. The mode, if you remember, is the number that shows up most often, so in this case the mode is 20. The median is the middle number. Because there are two numbers in the middle, 20 and 22, the median is their average, or 21. Already you know that I is not true, so you can eliminate Choices (A) and (C). Now you need to determine the mean, also known as the average. To find the mean, add all the numbers together and divide by the number of numbers: (13 + 19 + 20 + 20 + 22 + 29 + 42 + 63) ÷ 8 = 228 ÷ 8 = 28.5. Now you know that II and III are both true, so the answer must be Choice D.
for line k, you’re looking for a line with a slope of , and Choice (C) is the only option with that slope. 4. A. Plugging in –2 gives you f(–2) = (–2)2 + 2(–2) + 1 = 4 + (–4) + 1 = 1, so Choice (A) is your answer. equation by 3, getting x = 6. Now that you know what x is, 3x will be 3(6) = 18. 6. 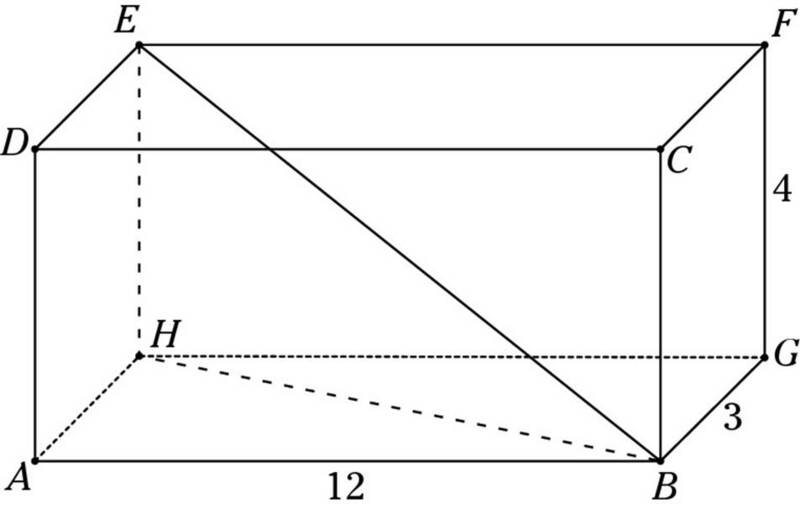 E. Triangle inequality! Remember that in any triangle, the sum of any two sides must be greater than the length of the third side. (See Chapter 16 to review this idea.) So, adding sides AB and BC, you get 27 units. The third side must be shorter than 27, so Choice (E) is the only answer that’s impossible. 7. D. Remember that the absolute value symbol turns everything inside into a positive number, so you know that x + 2 equals 3 or –3. Now you can solve both equations. The first equation, x + 2 = 3, results in x = 1, and the second, x + 2 = –3, results in x = –5. Choice (D) is the only option that includes both of these answers. 8. D. You can determine what percent of the Algebra II students earned Ds by subtracting all the other percentages from 100%: 100% – 21% – 33% – 27% = 19% of Algebra II students earned Ds. You know that 76 students earned Ds, so 19% = 76 students. You can divide both sides by 19 to find that 1% represents 4 students. To determine how many students earned Bs, simply multiply the percent of students who earned Bs, 33%, by 4: 33 × 4 = 132 students. 9. A. If a team has four times as many girls as boys, then out of every five players, four must be girls. So you’re looking for an answer that’s a multiple of 5. Choice (A) is the only option that works. 10. B. The trick to this problem is to see that x2 + 2ax + a2 can be factored into (x + a)2. Now you can rewrite the equation as (x + a)2 = 16, so you know that x + a has to equal 4 or –4. Choice (B) is the right answer. 11. B. Set up a Venn diagram to solve this problem. 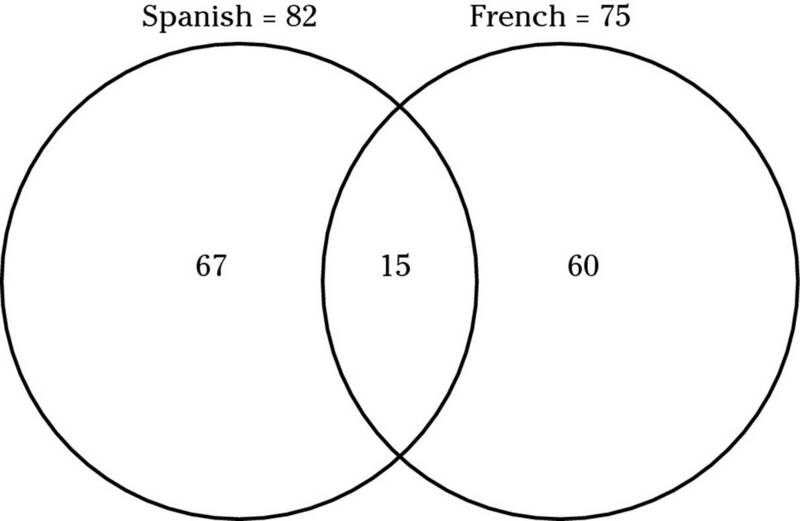 Now you can see that there must be 82 – 15 = 67 students who take only Spanish, and ­ 75 – 15 = 60 students who take only French. Now you can add up the students in each ­section: 67 + 15 + 60 = 142 students studying Spanish, French, or both. Because there are 150 students in the 11th grade and you just determined that 142 of them are studying French and/or Spanish, that leaves 150 – 142 = 8 students who are not taking either class. 12. D. Break this problem into a few different parts: a # b = ab, 3 # 2 = 32 = 9, and 2 # 3 = 23 = (2)(2)(2) = 8. So, (3 # 2) – (2 # 3) = 9 – 8 = 1. Now you need to check I, II, and III to see which, if any, of them are equal to 1. Because any number raised to the 0 power equals 1, 4 # 0 = 40= 1, making Option I true. Therefore, Choices (A), (D), or (E) may be the answer. Option II is true because 1 # 3 = 13 = 1, so Choice (D) must be the answer. You can check Option III just to be sure: 2 # 1 = 21 = 2. 13. D. Drawing a picture for this problem is a good idea. If you don’t immediately recognize this as a 30°-60°-90° triangle, you can use the Pythagorean Theorem to find the third side of the right triangle formed by the diagonal (which will be the length of the rectangle). For the moment, call the length of the rectangle a. Plugging into the Pythagorean Theorem, a2 + x2 = (2x)2 simplifies to a2 + x2 = 4x2, or a2 = 3x2. You take the square root of both sides and get . Now that you know the length of the rectangle, you can find the area by multiplying the length by the width: , Choice (D). 14. C. The key to this problem is determining what the constant difference between the terms is. You know the second and fourth terms, so the difference between them (17 – 9 = 8) is twice the value of the constant difference, meaning that the constant difference is 4. From here, you can either make a list of the terms until you get to the 13th term (remember that 9 is the second term, not the first! ), or you can use the formula you know from Chapter 12: The nth term = the first term + (n – 1)d, where d is the difference between the terms in the sequence. For this question, n is 13, d is 4, and you can get the first term by subtracting the constant difference, 4, from the second term: 9 – 4 = 5. Using the equation, the 13th term is 5 + (13 – 1)4 = 5 + (12)4 = 5 + 48 = 53. 15. E. Adding 3 to a function adds 3 to the y-value of each coordinate on the graph. Therefore, f(x) + 3 will look like f(x) shifted vertically upwards by 3 units. Choice (E) is the only option that shows the original graph shifted upwards. will be , which is about 21%. Choice (B) is the closest to 21%. 17. C. To solve this problem, you have to remember that the sum of the exterior angles of any shape is always 360 degrees. (See Chapter 16 to review this idea.) If you don’t remember that handy tip, you can also calculate the sum of the exterior angles for this pentagon. First, you determine what the sum of the interior angles is. Pick one vertex and draw straight lines to each of the other vertices, creating three triangles. You know that each triangle contains 180 degrees, so the pentagon, with three triangles, has 3 × 180° = 540°. You also know that each straight line has 180°, so each exterior angle plus its interior angle has 180°. There are five exterior angles, so the sum of all the interior and exterior angles is 5 × 180° = 900°. Now all you need to do is subtract: The sum of all the interior and exterior angles minus the sum of the interior angles gives you the sum of the exterior angles: 900° – 540° = 360°. 18. B. For this problem, it’s probably easiest just to calculate the numbers. 11:30 a.m. is the time closest to 2,000 visits, so Choice (B) is the best option. 19. C. If you want to fill the box three-quarters full, you need to determine what three quarters of the volume of the box is: 3⁄4(5 × 5 × 8) = 3⁄4(200) = 150 in3. If 5 cubic inches of the box are filled per minute, it will take 150⁄5 = 30 minutes for the box to fill three quarters of the way from empty. If it starts to fill at 3 p.m., then at 3:30 p.m., it will be three-quarters full. Choice (C) is the right time. 20. D. Because line m is parallel to line n, angle BAC equals angle 1 because they are corresponding angles. Because AB is congruent to CB, triangle ABC is an isosceles triangle. Therefore, angle BCA is the same as angle BAC, so both are 35 degrees. The angles of the triangle must total 180 degrees, so ∠2 + ∠BAC + ∠BCA = 180°, or ∠2 + 35° + 35° = 180. Subtracting, you find that angle 2 is 110 degrees. 2. A. So you see a canvas that’s red with one little black line. You may say, “I don’t get it!” or something similar. But if you’ve struggled to find exactly the right red and the perfect line length, you know the process of creation is difficult. Therefore, you’re searching for a pair that expresses a meeting (encounter is “to come upon” or “to meet”) and an understanding (grasp is “to understand”). This pair appears in Choice (A). 3. B. What makes you comfortable, financially? A big fat bank account, which you get by saving as much money as possible. All the choices refer to the party-like-there’s-no-tomorrow school of financial planning, except for Choice (B). If you’re prudent, you’re careful and ­sensible — all the way to the bank! 4. B. You need a law most when someone has gone against, or violated, the principle established by the law — a concept expressed by Choice (B). Did I catch you with Choice (D)? To trespass is to go where you don’t belong, and you can’t travel into (or on or over) a right. 5. E. A quirk is an odd little habit. (I won’t tell you about my quirks if you don’t tell me about yours.) Eating green candy and avoiding a vowel are definitely quirks, not just neutral habits, also known as Choice (D). Because the actor isn’t asking someone else to eat the candy or talk without the letter e, Choice (A) doesn’t fit. The other answers aren’t even close. 6. D. How do you know that a politician has carefully considered ideas that disagree with his or her own views? Well, you listen for arguments that weigh the pros and cons, statements that acknowledge, or recognize, the advantages and disadvantages of a position. No doubt about it: Choice (D) is the one you want. Choices (A), (B), and (C) rule out careful consideration. Choice (E) is tempting, but praise isn’t necessarily based on thoughtfulness, so (D) is a better answer. 7. C. This sentence calls for opposites — how Gary normally behaved and how he behaved after the accident. The only answer expressing opposites is Choice (C). For vocabulary builders: equanimity means calmness, restraint implies that you’re holding your feelings in, joviality is cheerfulness, and amiability is the SAT’s way of expressing friendliness. 8. E. This one is easier than it looks. If she made a prediction that came true, Sarah sees into the future. Immediately you can eliminate Choices (A) and (C), which look to the past. (Words with retro- and hind- deal with what’s behind.) Choice (B), introspection, refers to the process of looking inward. Choices (D) and (E) both deal with predictions, but (D) suggests magic, and it’s more likely that Sarah relied on polls than potions. 9. C. This question contains a familiar trap. Your real-world knowledge may steer you to Choice (A) or (B) because “natural” products are often advertised as free from additives and pesticide residue. However, in the context of the passage — the only context that matters — the author discusses the “trends and changes in climate” (Line 9) that affect taste. The comment about wine’s differing characteristics being “embraced and celebrated” (Line 3) reveals that the natural variations are, in the author’s view, their beauty. 10. B. Lines 7–8 tell you that “herbs and spices are typically intense versions of plants,” ­directing you to Choice (B). 11 E. The author states that a “culture’s literature is that culture’s communal voice” (Lines 2–3). Choice (E) follows logically from that statement, because without “a communal voice,” (Line 3) “a community cannot express itself fully,” as (E) states. 12. A. The lines immediately preceding the question, “Which way freedom?” (Line 9) state that “Struggle has been a primary trope of black people in America” (Lines 7–8) and beyond. Therefore, the question serves as a representation of “Struggle” in this passage. Vocabulary builder: A trope is a figure of speech, such as a metaphor. 13. C. The key to this question is the pronoun “that” (Line 4). Once you determine the meaning of “that,” you know what Locke is talking about. Just before this pronoun is a statement about the mind’s powers: “We shall not have much reason to complain” (Line 1) about the mind’s limitations (“narrowness” — Line 2) if we “employ” (Line 3) the mind “about what may be of use to us” (Line 3). The last quotation is another way of saying that “our minds are able to accomplish many useful things,” also known as Choice (C). 14. B. Some work is better than none, according to this passage. The servant isn’t excused from chores because the house is lit only by a candle, not by daylight — a concept expressed by Choice (B). 16. D. You’ve probably figured out that the Candle is a symbol of human intelligence. The expression “bright enough” (Line 13) is key, because the statement means that we human beings have enough candle-power (intelligence) for our “purposes” (Lines 13–14). Therefore, the only real contenders are Choices (A) and (D). Choice (D) is better than (A) because the statement you’re being questioned about doesn’t address the amount of intelligence. The statement simply explains that intelligence is in proportion to human needs. 17. A. The line doesn’t always reach the bottom of the ocean, but it does warn of shallow water (“caution him against running upon shoals that may ruin him” — Lines 40–42). The line and the brain are analogous (similar); if you know what you don’t know (the very deep parts of the ocean, in the sailor story), you’ll use your brain where it can actually help you (near “shoals,” or shallow water — Line 41). No doubt about it: Choice (A) fits perfectly. 18. B. Passage I moves from candles to sailors to make a point, but Passage II stays with one comparison, that of the cave. True, Plato goes into detail about the cave, but he never strays from that single comparison. Because human beings aren’t stuck in caves, Choices (A) and (D) are out. (Yes, I know that Lines 74–75 state that “the truth would be literally nothing but the shadows of the images,” but the literal truth here is in the context of a fantasy about humans who are chained in caves.) Choices (C) and (E) don’t make sense in the context of the passage. 19. C. Plato, in Passage II, imagines human beings chained in a cave with no chance of perceiving anything but shadows. Because these shadows are all that they see, the shadows seem real. When the chains are off, a former prisoner will see reality, which at first he will reject (“he will be unable to see the realities of which in his former state he had seen the shadows” — Lines 82–84). Therefore, perspective matters, and (C) is your answer. 20. A. Passage II is an exercise in visualization. The speaker asks the reader to imagine a cave, prisoners, shadows, and finally exposure to objects outside the cave. There you go: Choice (A) is the answer you seek. 21. C. This question tests your ability to untangle complicated syntax. (Syntax is the way words are put together grammatically to form a sentence.) In Line 76, the very long sentence in which “illusion” (Line 85) appears begins with released prisoners turning toward “the light” (Line 80) and hearing someone say that “what he saw before was an illusion” (Line 85). Well, what the prisoners saw before were shadows — the answer in Choice (C). 22. D. When you run across a “both” question in a paired-passage exercise, beware. You often find an answer that’s true for one of the passages, but not for the other. Here, the only answer that applies to both is Choice (D). In Passage I, the assumption is that no human being can know everything. In Passage II, only some human beings recognize the truth when it’s presented to them. 23. B. Time to dust off your old English notebooks. A metaphor is an implied comparison, such as the candle and the sailor’s line in Passage I and the cave in Passage II. Just to build your vocabulary a bit: personification occurs when you give human qualities to a nonhuman element.Concession and reply (a great tactic for arguing with Authority Figures, by the way) is the acknowledgement of the opposing side’s position, just before you demolish that position. Hyperbole and understatement are opposites; the first term applies when you exaggerate and the second when you minimize a situation. 24. A. Plato’s whole point is that given only reflections (“shadows” — Line 92) to see, the true object will appear to be an illusion. Therefore, “you’re wrong” — Choice (A) — is probably the “reply” to anyone’s first view of reality. 1. C. You know that when you square x + 1, you get 64, so x + 1 must equal 8 or –8. Set up two equations: x + 1 = 8 and x + 1 = –8. Solving those equations for x, you get x = 7 and x = –9. Because –9 is not one of the solutions offered, (C) must be the right choice. If you’re totally stumped by a problem like this one, you can always plug in the answer choices to see which one works! 2. D. Recall that prime numbers are numbers that are only divisible by themselves and 1. Also recall that 1 is not prime (it’s “special”), and that 2 is the only even prime. Therefore, the primes that are less than 16 are 2, 3, 5, 7, 11, and 13. Each of the other numbers in the set is divisible by a number besides 1 and itself (15, for example, is divisible by 1, 3, 5, and 15). So you have 6 prime numbers, and there are 15 numbers in the set. Now you see that the probability of picking a prime number is 6⁄15 = 2⁄5. Choice (D) is the correct answer. 3. D. You want to use the counting principle to solve this question. (See Chapter 18 for a refresher on probability.) The counting principle tells you that when multiple events appear in a problem, the total number of possibilities is the product of the number of possibilities for each event. In this problem, you have three events: choosing a pair of pants (four possibilities), choosing a shirt (six possibilities), and choosing a pair of shoes (two possibilities). Therefore, you know that 4 × 6 × 2 = 48 different outfits you can make. 4. D. When the test writers (and math teachers in general) talk about f(x), they’re really talking about the y-values on the graph. In this question, where you’re asked about f(x) = –1, you really want to focus on when the y-value is –1. 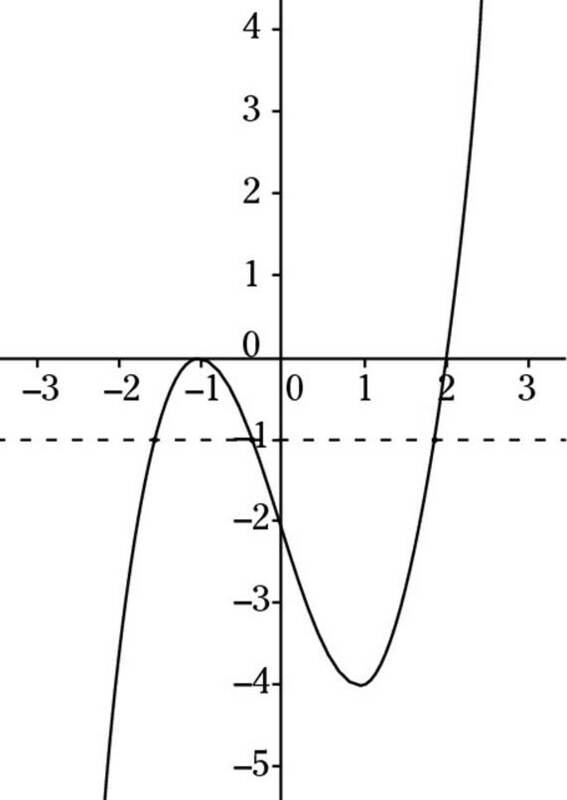 As you can see in the following graph, this happens three times, so f(x) = –1 has three solutions. 5. E. PEMDAS (covered in Chapter 12) reminds you that you need to deal with exponents before multiplication, so you should concern yourself with the (3x100)3 first. Recall that exponents distribute inside of the parentheses, and that when you have an exponent raised to an exponent, you multiply them. Therefore, (3x100)3 = 33 · (x100)3 = 33x300 = 27x300. Now you can deal with the x. You know that x = x1, so x · x300 = x1x300 = x301. In the end, you have 27x301, Choice (E). 6. B. If the lemon juice costs 85 cents per cup and you’re using 5 cups, you’re spending $0.85 × 5 = $4.25 on lemon juice. If the sugar water costs 25 cents per cup and you’re using 7 cups of sugar water, you’re spending $0.25 × 7 = $1.75 on sugar water. That makes 12 cups of liquid, costing $4.25 + $1.75 = $6.00. To determine how much one cup of lemonade costs, divide $6.00 by 12 cups, getting $0.50 per cup, Choice (B). 7. A. You know that Johnny wrote four articles and that amount was the largest, so you can eliminate Choice (C), because if Mario had written four articles, Johnny would not have written the most. You can eliminate Choice (E) for the same reason. You know that Lucas wrote the fewest articles among the boys and that Natalia and Mario wrote the same number of articles. Therefore, Lucas wrote fewer articles than Natalia, so Choice (D) is out. You’re left with Choices (A) and (B). Karen and Lucas may have written the same number of articles; they both wrote fewer than Johnny, Natalia, and Mario, but it’s possible that they wrote different numbers of articles. There’s no way to know for sure that Choice (B) is true with the given information. Choice (A), however, must be true. Natalia could not have written four articles because Johnny wrote four and was the most prolific writer; therefore, she wrote three or fewer articles. Choice (A) is the best option. 8. D. All the lines in the drawing must be 4 units long. You know this fact because the square’s sides all have a length of 4, so the side of the equilateral triangle touching the square is 4 units long. Because the triangles are equilateral, all sides are the same length. The area of the square is 4 × 4 = 16 square units. The equilateral triangles have 30°-60°-90° triangles inside of them; you can use your knowledge of special triangles to determine the area of these triangles. 9. 13. Because the average time over four dashes was 15.5, the total time for all four races is 4 × 15.5 = 62 seconds. You can now subtract each of the three dash times that you know in order to determine the missing time: 62 – 16 – 18 – 15 = 13 seconds for the final dash. 10. 5. You first want to put everything on one side of the equation, so that you can factor: x2 – 3x – 10 = 0. To factor, you’re looking for two numbers that multiply to –10 that also have a difference of 3. The numbers –5 and 2 will do the trick: (x – 5)(x + 2) = 0. Now set each factor equal to 0 and solve for x. You find that x is 5 or –2. Because it’s impossible to grid in negative numbers, the answer must be 5.
you find that m + b = 2 + 7 = 9. 12. 6. Because the ratio of length to width is 5:3, you can represent the length as 5x and the width as 3x. You know that area equals length × width, so the area = (3x)(5x), which equals 60. Simplifying, you get that 15x2 = 60, and then x2 = 4. Mathematically, this result means that x is either 2 or –2. It doesn’t make sense for a rectangle to have a negative dimension, so x is 2. You’re looking for the width of the rectangle, which you called 3x and which you now know is 3(2) = 6. 13. 27. A chart is probably the easiest way to solve this problem. If you know that when you divide a number by 5 you get a remainder of 2, then you know that the number is two more than a multiple of 5. Similarly, the number can be represented as six more than a multiple of 7. Because you know the number is less than 50, you know where to stop your chart. Because the number 27 shows up in both columns of the chart, that must be the answer! You can double check: 27 divided by 5 is 5 with a remainder of 2 (check! ), and 27 divided by 7 is 3 with a remainder of 6 (check!). 14. 17. Watch out! Make sure you don’t fall into the trap where you think that (a + b)2 = a2 + b2. You need to FOIL in order to square a + b. (Check out Chapter 14 if you need to brush up on FOIL.) If a + b = 5, you can solve for a, and determine that a = 5 – b. Using substitution, you can determine that ab = (5 – b)b = 5b – b2 = 4. Set this equal to 0: b2 – 5b + 4 = 0, and then factor: (b – 1)(b – 4) = 0. That means b is 1 or 4. If b is 1 then a is 4, and if b is 4 then a is 1. Either way, a2 + b2 = 12 + 42 = 1 + 16 = 17. Here’s another way to think about this problem: Hopefully you remember that (a + b)2 = a2 + 2ab + b2, which seems to have all the necessary elements. That means that (5)2 = 25 = a2 + 2ab + b2 by substituting a + b = 5 into (a + b)2 = a2 + 2ab + b2. To get the right side of the equation to equal a2 + b2, you want to subtract 2ab, so 25 – 2ab = a2 + b2. You already know that ab = 4, so 2ab = 2(4) = 8, so a2 + b2 = 25 – 2ab = 25 – 8 = 17. 15. 165. It costs $525 to hire the band for 3 hours, and it costs $765 to hire the band for 5 hours. You can see that 2 extra hours of music costs an additional $765 – $525 = $240, so each hour of music costs $120. The $525 is three times the hourly rate plus the flat fee (call the flat fee x), which can be represented as 525 = 3(120) + x. Solve for x, and you learn that the flat fee is $165. You can double-check your answer by checking that the flat fee plus 5 hours of music costs $765: 165 + 5(120) = 165 + 600 = 765. 16. 80. For problems like this one, marking up your test booklet is always a great idea. Remember that the drawing isn’t to scale. Draw in the values for angles 1 and 7. You can immediately see that angle 6 must have a measure of 180° – 130° = 50°. Then, because you know that is parallel to , is a transversal, meaning that angle 2 is equal to angle 6 because they’re alternate interior angles. Now you know the measures of two of the angles in the triangle ABE, so you know that angle AEB = 180° – 50° – 50° = 80°. Angle 4 and angle 3 are vertical angles and, therefore, equal, so the measure of angle 4 is 80 degrees. equation by 2, you get that 16 + h2 = 52, so h2 = 36. This result means that h equals 6 or –6. The answer must be 6 because you can’t grid in negative numbers. If you need to brush up on problems in which the SAT makers create new symbols, check out Chapter 14. BHE to find the length of . Check out the following diagram for clarification. 1. D. Because Margaret is a teacher, she’s an educator, and the original sentence, as well as Choices (B) and (C), removes her from the group of educators. You need “any other” in order to compare Margaret to the group. Choice (D) is a better answer than (E) because had places an action in the past prior to (before) another action in the past. Logically, Margaret has to do her job after she becomes a teacher, not before. Therefore you can rule out Choice (E) and opt for (D), the correct answer. 2. B. The expression correctly predicting a downturn in the market is extra, not essential to the meaning of the sentence. Nonessential descriptions are enclosed in commas. The original sentence has the first comma, but not the second (after market). Choices (C) and (E) add the pronoun he, but because you have a noun (broker) doing the job, you don’t need a pronoun also. Choice (D) adds an unnecessary had. The helping verb had places an action or state of being before another past-tense event. 3. D. The noun man is singular, so their (a plural pronoun) is a mismatch. In Choice (D), the singular noun man is correctly matched with his, a singular possessive pronoun. Were you tempted by Choices (C) and (E)? In those answers, the plural noun men matches the plural pronountheir. However, Choice (C) contains a double negative. The word forbid tells you what the men can’t do, so not is superfluous (extra, unnecessary). Choice (E) tries to insert a clause (who should not speak to their mothers-in-law) in an illogical way. 4. D. In sentence improvement (and in all sorts of writing), opt for the concise but complete wording. Choice (D) gets the job done, quickly and cleanly. The original — Choice (A) — is incorrect because the pronoun it has no clear meaning. It may be the watering, the fertilizer, or the fact that the gardener added these things. Nope! Pronouns must refer unambiguously (without a vague or double meaning) to a noun or pronoun (or a couple nouns and/or ­pronouns). Choice (C) has the same problem, only this time the ambiguous pronoun is which. Choices (B) and (E) are passive, which is never a good choice when active voice is available. Choice (B) also has a dangling modifier — the introductory verb form that must describe the subject. As Choice (B) is written, the plant is watering and fertilizing itself. No doubt about it: Choice (D) is the answer you seek. 5. C. The word however sounds great, doesn’t it? Important and strong! However, however isn’t allowed to join two complete sentences, which you have in Question 5. Add a semicolon before however, and you’re all set. If you set your sights on Choice (C), you found the correct answer. 6. A. Yes, I actually threw in a correct sentence. I was testing your knowledge (as the SAT makers will) of two basic ideas. The reason is because is never correct; always go for the reason is that. Also, the subject of the sentence is reason (a singular noun), which must be paired with the singular verb is, not the plural verb are. 7. B. In the original sentence — Choice (A) — no person is named as struggling and falling. By the rules of grammar, therefore, the subject that is named in the sentence (in this case, judges) must be performing the actions in the rest of the sentence. But the judges aren’t falling, though they may be struggling to decide an appropriate score. Bingo: Choice (A) is out. Choice (C) improperly pairs was struggling with having fallen. Choice (D) needs a helping verb for struggling, such as was. Choice (E) slips into passive voice, never a good move. Plus, when you insert the text from Choice (E) into the rest of the sentence, the result doesn’t make sense. Yup, Choice (B) is the answer. 8. E. The word whether is generally paired with or not and applies to two alternatives. The elements of this pair shouldn’t be too far apart, as they are in Choices (A) and (B). If applies to a condition: Something will happen if the condition is met. In Question 8, whether makes more sense, and Choice (E) places the alternatives near each other, making it the correct answer. 9. A. Introductory verb forms without helping verbs (in this sentence, Given new information) take on the tense of the main verb in the sentence. In the original sentence, the new information and the revising are more or less simultaneous. This is a plausible (believable) meaning, so the sentence is correct as written, and your answer is Choice (A). Choices (B) and (E) don’t need the her, and (C) has a superfluous (extra) had. Choice (D) is wordy. The correct answer is (A). 10. C. The original “sentence” isn’t a complete sentence because it doesn’t contain a statement that can stand alone and make sense — an independent clause, in grammar lingo. Choice (C) rectifies (corrects) this problem. If you’re nuts about understanding the grammatical reasoning, read on. In (C), the subject is wedding. The subject is paired with three verbs (had been scheduled, was postponed, rescheduled), each of which is linked by a conjunction (but, and). 11. B. The problem with the original wording, Choice (A), is the switch from active voice (ripped) to passive (were broken) for no good reason. Choice (B) makes both words active. The other choices complicate the issue unnecessarily by plopping had where it doesn’t belong. 13. A. Quick is a description, and the adjective sure can’t intensify another description. For that job, you need the adverb surely. 14. B. The pronoun either (along with its close relative, neither) is singular and should be paired with a singular verb. In this sentence, are, a plural verb, doesn’t work, so Choice (B) is the answer you seek. 15. D. The word between is a preposition and should be followed by objective pronouns, not subject pronouns (such as I). The correct expression is between you and me. 16. D. The elements of the list should match grammatically. In Question 16, chance and funding are nouns, but he could hire is a subject-verb combination. Because could hire is a mismatch, it’s wrong, and Choice (D) is the correct answer. 17. C. The pronoun someone is singular, but the pronoun they, which refers to someone, is plural. Mismatch! The correct version is he or she. 18. D. The expression, her viewers to spend, isn’t Standard English. The correction would be that her viewers spend. 19. E. Yes, I finally gave you a correct sentence. Wasn’t that nice of me? I did, however, throw in a distraction. Some people worry about beginning a sentence with because. Actually, because isn’t a problem as long as the statement it begins is attached to a complete thought, as it is here. 20. B. The subject of this sentence is number, a singular noun, which should be paired with a singular verb such as has made. Choice (B) is have made, a plural verb, and the error you’re looking for. 21. C. Weaker is a comparison already, so more isn’t needed — or wanted! — here. 22. C. The word every is extremely strong. Put every in front of a subject that appears to be plural (customer and client, in this sentence), and the subject becomes singular. Why? I’m so glad you asked. Every changes the meaning of the sentence so that the customers and clients are considered individually, one by one. Therefore, were open should be was open, and Choice (C) is the answer. 23. A. The present perfect tense talks about something that began in the past and continues in the present. In Question 23, the cousins no longer live in Spain. Therefore, the present-perfect verb form, have been living, is wrong. The correct verb is lived. 24. B. The comma in Choice (B) joins two complete sentences. Penalty box! You need a semicolon or a conjunction such as and, because, or something similar to link these two ideas. Were you fooled by Choice (D)? The teachers don’t object to the students. They object to the students’ typing. The apostrophe correctly shifts the emphasis from the people to the action. 25. C. The only should precede the idea to which it refers. The sentence should read are complicated only by a dispute. 26. A. Here and there can’t be subjects, so the true subject of this sentence is photos, a plural noun. There’s is a contraction of there is, but the proper verb is are. 27. B. The way the sentence now reads, the hotel has gone on vacation for three years. Nope. An introductory verb form must refer to the subject of the sentence. Thus, your error is Choice (B). To correct this sort of sentence, you’d need to say something like Having gone on vacation for three years, the family was disappointed . . . you get the idea! 28. A. Double negatives are a no-no (pun intended). Can’t help is a negative, as is the but. The correct expression is can’t help objecting. 29. B. Consequently is a long word, but even so it’s not strong enough to link two complete sentences, which you have in Question 29. The comma after dented should be a semicolon. 30. B. The subject of Sentence 2 is intimidation, a singular noun, which requires the singular verb is prohibited. The correct answer is Choice (B). 31. C. The entire essay is in third person, except for Sentence 3 and a final statement of opinion in the conclusion. The conclusion may be personal, so first person is justified there. However, Sentence 3 sounds awkward — one second-person sentence in the midst of many third-person statements. Take it from me: Choice (C) is best. 32. C. Sentence 5 is a run-on — a grammatical felony. You can’t glue two complete sentences together with a comma. Choices (B) and (C) both address this issue, but (C) does more. It changes “this” to “these comments,” a more specific and therefore better expression. 33. D. The topic of this essay is cyberbullying, but that term doesn’t appear until the second paragraph. By defining the term in the first paragraph, the reader is alerted to the content of the essay right away — a good strategy! Once the definition is inserted into Paragraph 1, the statement in Sentence 6 isn’t necessary. 34. B. The paragraph gives some indication why some people want to criminalize cyberbullying, but it doesn’t truly explain the importance of free speech — the position the writer advocates (argues for) in the last paragraph. To balance the statements about limits on free speech, the writer should address the benefits also. 35. C. The original sentence is wordy and awkward. Choice (C) is simpler and more concise. No question, (C) is your answer. 1. A. Logic tells you that this sentence can go one of two ways. Either the room was huge and everyone had a ton of space, or the room was tiny and people were stacked to the ceiling like firewood. Choice (A) fits the first scenario, because capacious means “roomy,” and ample means “more than enough.” No pair fits the second scenario. Continuing the vocabulary-building exercise, minuscule = tiny, choleric = angry, and gargantuan = huge. Of those three, you may have jumped at “gargantuan.” However, the other half of Choice (E) — “ineffective” — doesn’t fit the sentence. 3. A. What makes you accomplish 1 percent of your homework? Indolence, also known as ­“laziness,” which is choice (A). 4. B. The politician in the sentence (unlike some politicians in real life) has chosen the “high road” and “vowed to run a positive campaign.” So what would the politician rule out? Anything negative, such as derogatory (critical or belittling) comments, which is Choice (B). Vocabulary time: Laudatory means “praising or admiring.” A deferential person treats others as if they were of higher rank. An obsequious person flatters or caters to someone else in an extreme manner. 5. C. If you pinch every penny twice, you’re a miser, Choice (C). Choices (A) and (B) waste money, Choice (D) steals it, and Choice (E) gives it to charity. Go for Choice (C) and you’re right! 6. D. You’re looking for a word that means to cut down, because no principal I’ve ever met (and I’ve met many) rewards lateness. Therefore, you can dump Choices (B) and (C) immediately. Choice (A), abridged, generally refers to written matter, as does Choice (E). You’re left with Choice (D), which is the correct answer. 7. E. This is a trick question, because Charlotte, Katie’s sister, thinks that Katie is somewhat snobby — Choice (C). However, that’s Charlotte’s view, not necessarily the reader’s opinion of Katie. Plus, the “snob” issue doesn’t emerge until after the lines cited in the question. The other answers, except for Choice (E), have similar problems. Katie’s response comes later in the passage, as does her feeling of alienation (not belonging) — Choice (D). Nor does the reader ever find out why Katie is there, Choice (B). You’re left with Choice (E), a straightforward description of a poor neighborhood. 9. C. Just before the line cited in Question 9, Charlotte states, “Ma doesn’t complain” (Line 20). She also challenges Katie by asking, “Are you too big for the rest of us?” (Line 19). All of these comments are in response to Katie’s statement, “I want to vomit” (Line 16). Clearly, Charlotte believes that if their living conditions are adequate for Ma, they’re fine for Katie, who shouldn’t complain. Choice (C) is the best fit here. 10. E. When you encounter a “rule-out” question, cross off everything you find in the passage. Whatever’s left is the answer. Choice (A) drops out because Katie thinks about “some of the luxuries” (Line 26) of Port Elizabeth, and the passage opens with a description of poverty (Lines 1–14). Choices (B) and (D) are also nonstarters, given that Katie thinks about “the soft sea mist, the endless supply of water” (Line 28) and then describes the “dry season in Kimberley” (Line 29). Lines 24–25 mention “the first happiness of seeing Ma and Charlotte,” ruling out Choice (C). The sole survivor is Choice (E), which is your answer. 11. A. Because the passage references “the dry season” (Line 29) and “the rainy season” (Line 37), you know that Kimberley, where the family resides, isn’t in a desert. Down goes Choice (B). Choices (C), (D), and (E) aren’t supported by the passage, so you’re left with Choice (A). True, the passage doesn’t talk about the plumbing of Kimberley as a whole, but the reader does hear that “it was a long way for the girls to carry water” (Lines 31–32). 12. A. Ma knows only the basics, such as “how to wash out wounds” (Lines 56–57), which she learned by watching Katie’s grandfather “caring for his workers” (Line 59). Ma contrasts this informal medical training with the “much study” (Line 53) that Katie would need “to be a proper nurse” (Line 53). These lines lead you to Choice (A) or (B). Of the two, (A) is better because otherwise Ma is saying, in Lines 52–53, that “It takes much study to be an educated nurse” — a repetitive statement. Choice (A) is the correct answer. 13. B. Charlotte tells Katie that she “can’t be a proper nurse” (Line 62) because the nursing schools are reserved for whites. Charlotte believes that only “mopping floors and cleaning up after the Europeans” (Lines 65–66) is possible for Katie. These comments direct you to Choice (B). Did I catch you with Choice (E)? Charlotte thinks that Katie’s plans are “unrealistic,” but Charlotte’s reaction isn’t unrealistic. 14. D. Ma is the informal, only partially-trained doctor in the neighborhood. The fact that the author mentions the cost of the doctor visit (“seven and sixpence” — Lines 77–78) implies that this sum is significant to the family. The fact that Ma takes Katie to the doctor anyway tells you that Ma believes the illness is too serious to treat herself, a conclusion that leads you right to Choice (D), the correct answer. 15. A. Katie “knew she was not clever in her head like Charlotte” (Lines 85–86), so the first statement is true. Katie’s father believes in tradition (“That is the custom” — Line 105), but Katie clearly doesn’t, so II isn’t true because Katie is in the family. Katie held a job in Port Elizabeth (“she had worked too long” — Line 23) and sews “Charlotte’s clothes as well as her own” (Lines 88–89), so III isn’t true. There you go: Choice (A) is your answer. 16. B. You probably ruled out Choices (C) and (D) immediately, because while the characters may not always get along (Katie and Charlotte especially), the passage itself doesn’t confront (challenge) the reader. Of the other three choices, Choice (B) is best. Nostalgic implies a rosy, those-were-the-days sort of writing, and reflective has an element of putting everything in perspective that isn’t present in this passage. The facts are there, just as they happened, so Choice (B), “realistic,” makes sense. 17. D. The key phrase in this question is “the evidence in the passage.” Because Kimberley is poor and Katie misses the “luxuries” (Line 26) of Port Elizabeth, Choice (A) doesn’t work. Katie is in conflict with her family about careers and her relationship to Charlotte, but the passage shows her accepting, not rebelling against, her parents’ wishes, so Choices (B) and (C) don’t work. The passage hints at injustices, such as Charlotte’s comment that “nursing schools here are only for white girls” (Lines 63–64). However, Katie herself says nothing about justice, eliminating Choice (E). You’re left with Choice (D), which makes sense because Katie clearly loves her family, as the passage mentions “happiness of seeing Ma and Charlotte” (Lines 24–25). 19. A. I live in New York City, and if we had a party for everyone leaving or arriving, partying would be the sole activity in my hometown. But Kimberley is different; a departure or return is an event celebrated by the community — a conclusion that leads you directly to Choice (A). 1. A. For this problem, the angles given are supplementary to the angles inside of the triangle, so you can find the measure of two of the interior angles of the triangle. You calculate that 180° – 112° = 68°, and 180° – 100° = 80°. Now that you know two of the angles inside of the triangle, you can find p, the third angle, because you know that the angles in a triangle must add up to 180 degrees, and 180° – 68° – 80° = 32°. 2. C. You want to find out how much money Sita has in each type of account in 2009. To do so, determine the height of the middle, lightest colored bar in each section of the chart. You’ll see that she has $300 in checking, $700 in savings, $500 in retirement, and $600 in investment. Adding those values together, Sita has $2,100 in all her bank accounts in 2009.
with x as the total money in the bank: . Cross-multiplying yields 40,000 = 0.1x, so x = $400,000. y-intercept (b) of –1. If you prefer, you can solve this problem by choosing an x-value from the chart and plugging it into each of the equations to see which ones give you the correct y-value. Make sure to check all the choices, because you may have picked an x-value that works in more than one of the choices. If that happens, all you have to do is test each of the remaining choices with a new x-value from the chart. 5. D. When you see function notation, the first thought that pops into your head should be about substitution. In other words, f(x) tells you the rule to follow, no matter what’s put inside of those parentheses. So, f(2x) tells you to replace every x in the original equation with 2x: f(2x) = (2x)2 – 3(2x) + 1. You can simplify this to Choice (D) if you use PEMDAS (covered in Chapter 12)! Now you can see that you have a right triangle whose legs are 3 and 4 units long, so the hypotenuse must be 5 units long — it’s a 3-4-5 Pythagorean triple! 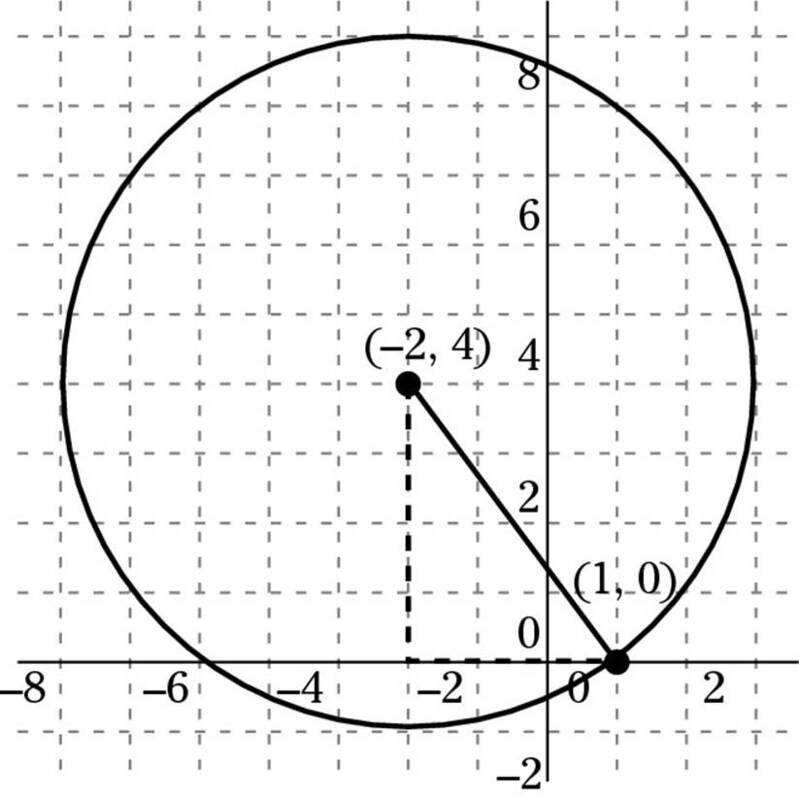 Now that you know that the radius is 5, recall that the formula for the area of a circle is A = πr2, so in this case, the area is π52 = 25π. 8. C. When in doubt, plug in numbers! For absolute value problems, you probably want to mix up positive and negative numbers so that you know you aren’t missing any obvious special cases. To test Option I, use a = 3 and b = –4. That seems to be true because –12 ≤ 12. You can also plug in a pair of positive numbers and a pair of negative numbers to double-check. Onwards to Option II! Check out a = –2 and b = 5. |–2 + 5| = |3| = 3, and |–2| + |5| = 2 + 5 = 7, so Option II doesn’t work. You already know that Choices (B) and (D) won’t work. Testing Option III, try out a = 3 and b = –4. |3 – (–4)| = |3 + 4| = 7, and |–4 – 3| = |–7| = 7, so Option III works! Choice (C) is the right answer. by 4 to get a + b + c + d = 60. The correct answer must be Choice (D) or (E). Next, you want to subtract the largest number from the product of the smallest three numbers. The problem tells you that a < b < c < d, so a is the smallest number and d is the biggest. Therefore, the product of the smallest three numbers is abc, and when you subtract the largest, you get abc – d = 34, Choice (E). 10. B. In this problem the test actually tells you to turn the paper upside down (rotate it 180 degrees), so go for it! Make sure that each symbol looks the same upside down as it does right side up; the symbol that doesn’t work is your answer. When you turn the second symbol (that looks like an E) upside down, it no longer looks like an E, so Choice (B) must be the right answer. two of these triangles, so their total area is . 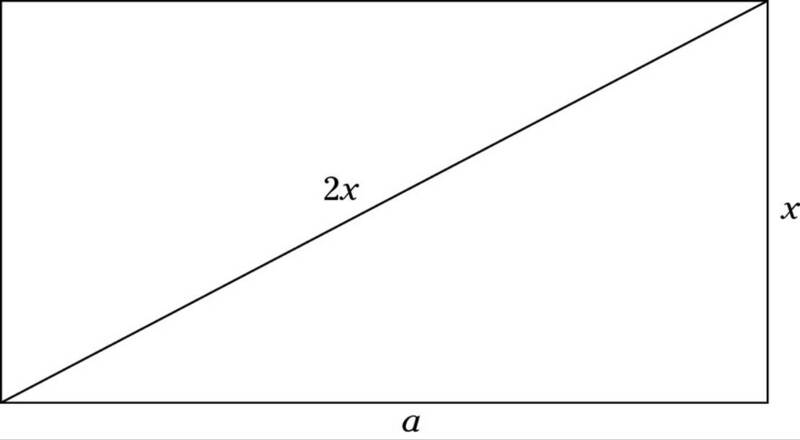 The area of the figure is the area of the rectangle plus the area of the big triangle plus the area of the small triangles, which equals , Choice (C). 12. D. Remember that if a in ax2 + bx + c is positive, the parabola will open upward (like a cup), and if a is negative, it will open downward (like a hill). This parabola opens downward, so you know that a is negative, and therefore a < 0; the right answer must be Choice (B), (D), or (E). The value of c turns out to be where the parabola intersects the y-axis (because on the y-axis the x-value is 0, so all the terms with x in them equal 0 too, leaving only c. The parabola shown clearly intersects the y­-axis where it is positive, so c > 0. Choice (D) is your answer! 14. C. Each time the wheel rolls, it travels the length of its circumference. Remember that circumference = 2πr or πd. So, in this case, the circumference is 24π inches, or 2π feet. Multiply that distance by 150 rotations, and the distance is 2π(150) = 300π. 15. B. Plug numbers in to solve this question. You know that when n is 1 (the first term), the value is 1⁄2. Check which answer options equal 1⁄2 when n is 1. (Keep in mind that anything raised to 0 is equal to 1.) Choices (A), (B), and (D) all work. Now, when n is 2, the value should be 2. Check n = 2 in Choices (A), (B), and (D) to see which one equals 2. Choice (A) equals 1, (B) equals 2, and (D) equals 1⁄4. Choice (B) is the answer. 16. D. Pick numbers and plug them in. Try p = 5 and q = 8. 5G8 = 5 + 8 – 3 = 10 and 8G5 = 8 + 5 – 3 = 10, so Option I seems to be true. 3G8 = 3 + 8 – 3 = 8, so Option II is true also. You’ve eliminated Choices (A), (C), and (E). To test Option III, let r = 4. (5G8)G4 = (5 + 8 – 3)G4 = 10G4 = 10 + 4 – 3 = 11, and 5G(8G4) = 5G(8 + 4 – 3) = 5G9 = 5 + 9 – 3 = 11, so Option III works as well. Choice (D) is the one you want. 1. D. What lasts for several hours? The musical, that’s what. Therefore, the description which lasts for several hours must be near the word it describes — musical. In its original position, the audience lasts for several hours, and mass casualties follow their exit from the theater. 2. C. The sentence begins in third person, talking about a student. Why switch to second person (you)? Because a student is singular, he or she is the proper subject for the second half of the sentence. 3. B. The original sentence lacks a proper subject-verb combination. The subject representative can’t pair off with having been admitted, which looks like a verb but actually functions as a description. Choice (B) supplies a verb that matches representative — was admitted. 4. A. Yes, I actually gave you a correct sentence, just for a change of pace. (You may see one or two on your real exam, though the number of correct sentences varies from test to test.) In Question 4, the semicolon correctly links two complete thoughts. 5. E. The original sentence is a run-on. Two complete sentences are glued together with only a comma — a grammar crime. Choice (E) is the only version to add a conjunction (and), a word that links two complete thoughts. Perhaps I fooled you with Choice (D). Subsequently appears strong enough to be a conjunction, but it isn’t. 6. D. Short and sweet wins the prize here. The comma after society isn’t needed because the conjunction and isn’t uniting two complete sentences — just two nouns. 7. E. This sentence falls into a category English teachers call “condition contrary to fact.” The speaker in the sentence didn’t know about the ink level, so a subjunctive mood (a fancy term for a verb mood, and yes, verbs have moods!) is called for here. Don’t worry about the terminology. Just remember that in a condition-contrary-to-fact sentence, “would” never appears in the portion of the sentence that isn’t true. The subjunctive is usually expressed by had (for action verbs) or were (for states of being). In this sentence, had fits better, because known is an action verb. 8. B. The introductory verb form, encouraged by her father to become an artist, must describe the subject of the sentence. But portraits weren’t encouraged to choose a career in art! Anguissola was. Once you figure that part out, you know that only Choices (B) and (C) are in the running. Choice (C) throws in an unnecessary had, so Choice (B) is the answer you seek. 9. C. The original sentence is wordy and awkward. Choice (C) chops out just the right number of words, leaving an appositive (the grammar term for an equivalent) to explain what the important fact is. 10. C. The description between the commas is most concise when which serves as the subject of two verbs, occupies and has. In the original, the pronoun they doesn’t have anything to refer to, because Tuvaluans — the most logical meaning of they — doesn’t appear in the sentence. 11. E. Ah, baseball. My favorite subject, second only to grammar. The original sentence is flawed because they may refer to either the players or the gangsters, so you can’t tell which group was punished. The rule says that a pronoun must have one and only one possible antecedent(the word the pronoun refers to). When a pronoun is unclear, sometimes the best solution is to rewrite the sentence without the pronoun, as Choice (E) does. 12. B. Last time I looked, biology was a subject. The original sentence compares biology to any subject, as if biology were not included in that group. The other moves biology back where it belongs, in the subject group. Choice (B) is better than the other choices that tuck in other,Choices (D) and (E), because those choices sound awkward or include unnecessary words. 13. D. Keep things simple, if you can! Choice (D) conveys the meaning without cluttering up the sentence with extra words. 14. A. Yeah! A correct sentence. Choice (A) gets the job done without fuss, beginning the sentence with two descriptions (prepositional phrases, for those of you who like grammar terms). The other choices add extra words for no reason.